Congradulations. If you so chose, your ready to get a socail midea id and eponymously show the world just how much smarter u r than them. Use a bunch of fowl langauge adn rmember - its all about being clever - rashonalty has nut'n to do with them. But dont loose ur head. I'm not usually a grammauthoritarian, but I am taken aback by the recent proliferation of sentences started with the word "Too". Who started this crazy idea? It's like they are saying "Two", but they never ever have a "One"! 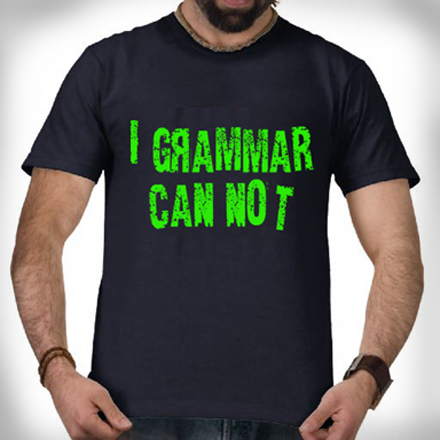 I GRAMMAR CAN! TOO CAN YOU! ASK ME HOW! This page contains a single entry from the blog posted on June 27, 2012 12:52 PM.